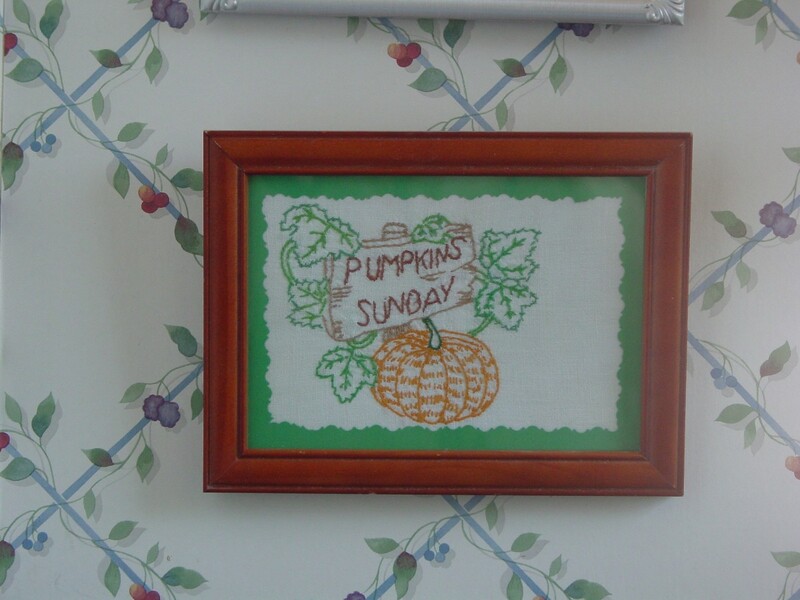 If you're like me, you grew up with aunts and grandmothers who embroidered things like cup towels and pillowcases. And, if you're like me, you probably leave them in the drawer while you use a terrycloth towel. My aunt made me a dish towel, probably 45 years ago, that I've always loved, but hadn't used in years. Recently I found it and decided I'd rather display it than wear it out, so I framed it. 1 Coordinating paper for mat, use what you have around the house. I bleached the cup towel and ironed it well. Then I cut the cloth to fit, covered the cardboard backing and held it in place with tape. I used some colored paper to make a mat, trimming around the inside edge with some scrapbook scissors. What a nice idea! My husband's great aunt used to crochet and embroider dish towels, hankies, washcloths, towels. Now I know how to display her embroidery.